The English passion for the wines of the winery from Copertino. A Bronze Medal and two recommendations from the Decanter World Wine Awards for Cupertinum wines! More precisely for Negroamaro, Primitivo and Spinello dei Falconi Rosato, all with the Salento Indicazione Geografica Tipica denomination. Decanter, monthly English review on wine culture, with editorial staff in Britain, but distributed in 90 countries, organizes every year the Decanter World Wine Awards, the most important and attended international wine award, competition founded in 2004. The results of the competition will be published in the August edition of Decanter, but the communication, signed by the director Steven Spurrier, has just arrived at the Winery and the winemaker Giuseppe Pizzolante Leuzzi and the president Francesco Trono immediately wanted to share this satisfaction with the partners, with all people from Copertino and Salento: “thanks to this international award we will contribute to enhance not only our wines but also the territory and its tourist and cultural heritages”. We remind that the Cupertinum wines, especially the red ones based on negroamaro and primitivo, have been appreciated by the English critics for over half a century. For example, Hugh Johnson, the great old man of wine criticism, the contemporary author who more than any other contributed to wine literature, and now a contributor at Decanter, already in the ’80s, with the Sunday Times Competition, awarded two wines of the Winery fron Copertino: Rosato and Copertino Doc. And recently, just on Decanter, Simon Woolf said: “Excess of wood from barriques is a widespread problem, but Cupertinum, one of the oldest and largest cooperatives in Salento, instead, gives a brilliant example with its Copertino Riserva, aged in vitrified tanks, really delicious”. Even the English market is rewarding the labels of the Cupertinum, which “stand out for their elegance and an excellent relationship between quality and price”. 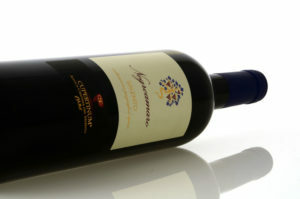 A winery that “has the talent to express the most visceral and sublime Mediterranean spirit in the bottle. An unmissable address for lovers of Negroamaro “.